Finding the right home inspector can be a difficult task. You need to know if they are knowledgeable. You need to know if they are trustworthy. And you need to know if they will be held accountable. 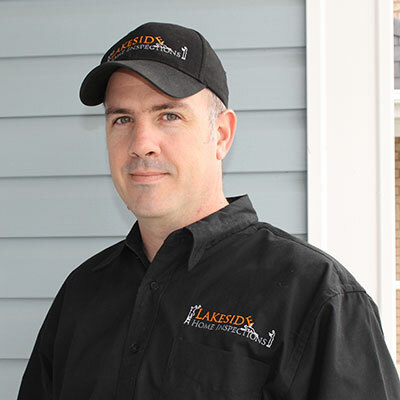 Dave Smith Owner/Inspector of Lakeside Home Inspections holds these high standards. The home inspection field was a natural transition coming from 15+ years in the trades industry. An eye for detail is second nature for Dave and he always has the client’s best interest at heart. He will take the home buyer through every step and answer any questions that they may have. Dave is a certified, insured home Inspector and a registered member of InterNACHI. His knowledge, personality and accountability will make any home buying experience exceptional. Purchasing a home, is the biggest financial decision anyone can make and hiring a trustworthy home inspector will give any home buyer peace of mind. Lakeside Home Inspections is dedicated to providing exceptional service and value, and guarantees all home inspections. A home inspection is one of the best investments you can make when selling or buying a home, a few hundred dollars now could end up saving you thousands of dollars later.